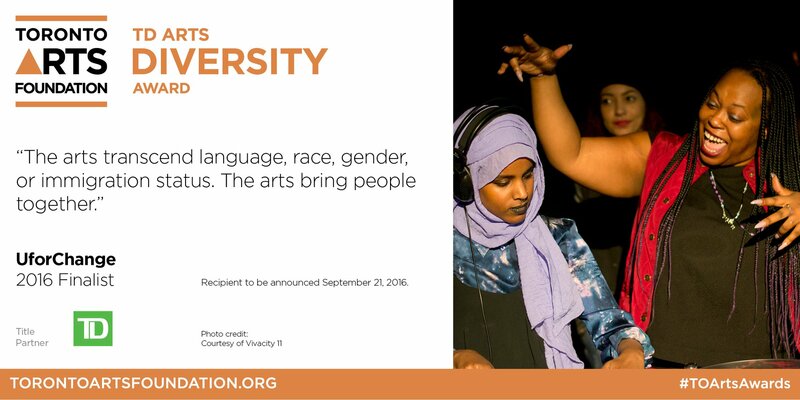 The UforChange team is more than overwhelmed to hear that we are one of five finalists for the 2016 TD Arts Diversity Award, administered by Neighbourhood Arts Network. We are very excited to be a finalist with other change-making organizations which include: The Arts Gallery of York University (AGYU), imagineNATIVE, Regent Park Film Festival and Remix Project. We can’t wait to find out the winner on Wednesday September 21, 2016! Toronto Arts Foundation, a charitable organization, provides the opportunity for individuals, private and public foundations, corporations and government agencies to invest in and strengthen the arts in Toronto. We are powered by a vision: Creative City: Block by Block, a commitment to connect every Toronto neighbourhood to the transformative social and economic benefits of the arts. Through sponsorships, legacy gifts and donations to our Creative City Funds, Toronto Arts Foundation gives voice to the arts, shines the spotlight on Toronto’s exceptional talent, and connects communities to the arts. To learn more about the Toronto Arts Foundation, please visit our website at www.torontoartsfoundation.org.